If you run a small business, you don’t need all the reports that QuickBooks 2017 offers, but many of these reports are extremely useful. Reports show you how healthy or unhealthy your business is, where your profits are, and where you’re wasting time and squandering resources. 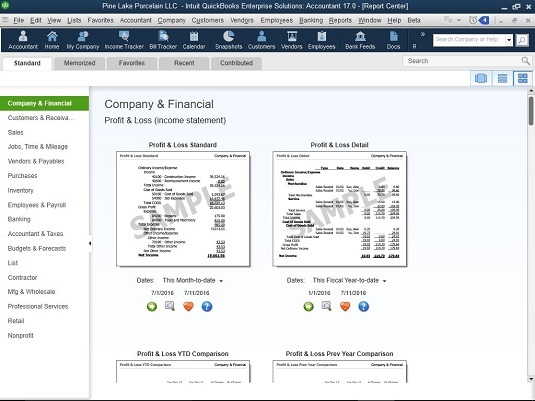 To make sense of what might otherwise become mass confusion, QuickBooks organizes all its reports in categories. You can see all the categories by pulling down the Reports menu or by clicking the Report Center icon. The names of the reports read a bit like public-television documentary names, don’t they? (“Tonight, Joob Taylor explores the mazelike federal budget in Budget Reports.”) You select a report category to see a list of report names. Or, from the Reports Center, select the type of report on the left. You see a list of the different reports available on the right side, with a description of the information contained in each one. To read the details about a topic, click that topic in the list. Company & Financial These reports give you a bird’s-eye view of your company’s health and cash flow. They give you a snapshot of your assets, liabilities, and equity, showing income, expenses, and net profit or loss over time. Customers & Receivables These accounts receivable reports are great for finding out where you stand in regard to your customer invoices. You can list unpaid invoices and group them in various ways, including by customer, job, and aging status. Sales These reports show what you sold and who your customers are. You can see your sales by item, customer, or sales representative. Jobs, Time & Mileage These reports let you see job and item profitability, compare job estimates with actual costs, view time recorded on jobs and activities, and look at vehicle mileage. Vendors & Payables These accounts payable reports tell you everything you need to know about your unpaid bills. You can list bills in a variety of ways, including by vendor and by aging status. This category also includes a report for determining sales tax liability. Purchases If you enable the Items and Purchases option within QuickBooks when you run QuickBooks Setup, these reports show from whom you bought, what you bought, and how much you paid. You can list purchases by item or by vendor. One handy report shows any outstanding purchase orders. Inventory These reports help answer the ever-important question “What items do I have in stock?” You can get an enormous amount of detail from these reports, such as how many units of an item you have on hand and how many units you have on order. You can group inventory by vendor or item. If you need price lists, you can print them by using a special report from your QuickBooks file. Employees & Payroll These reports, available if you signed up for one of the QuickBooks payroll options, offer ways to track payroll or check your payroll liability accounts. Believe me: These reports come in handy. Accountant & Taxes These reports include income tax reports, journal and general ledger reports, and a trial balance. Budgets & Forecasts These reports show you once and for all whether your budgeting skills are realistic. You can view budgets by job, month, or balance sheet account. Then you can compare the budgets with actual income and expense totals. (You need to have a budget already set up to use this report. List These reports let you see your lists in detail. You can see the contacts, phone numbers, and addresses on your Customer, Vendor, or Other Names lists, for example. You also can create a detailed report of your inventory. Industry Specific Some versions of QuickBooks also supply industry-specific reports under the Industry Specific submenu command. At this writing, QuickBooks comes in industry-specific versions for accountants, contractors, manufacturers, wholesalers, professional service firms, retailers, and not-for-profit organizations. Custom QuickBooks allows you to create customized summary reports and transaction listings. You create these reports by choosing either the Summary or Transaction Detail command from the Custom Reports submenu. If you’re not sure which specific report you want, you can use the Report Center. Just choose Reports → Report Center and then choose a report category in the list along the left edge of the Report Center window. QuickBooks displays a picture of the most common reports within the category in the Report Center window.